We’re hearing a lot about pressure these days. When this high pressure gets pulled into this low pressure, it’s the perfect storm. Then there’s work pressure, peer pressure, internal pressure—and we’re all worried about my mother’s blood pressure. A little bit of pressure is not a bad thing. If we were completely immune to pressure, we’d probably never get anything done. Too much pressure, on the other hand, makes me want to throw up my hands and walk away. Lately, I have felt pulled in a lot of different directions, and I’m running around keeping all of the plates spinning without accomplishing anything. I went on YouTube and listened to the Michael Jackson song “Scream” (I prefer the Glee version), just to share the feeling with someone. A few days ago, David and I sat down with my old 7 Habits of Highly Effective People binder and tried to figure out why we’re not being effective. If you ever have the opportunity to take this course, do it. I’ve never read all of the original book, and the seven-day course is ridiculously expensive, but Wake County gives it through its Human Resources department (condensed into five days), so I took advantage of it. 1) Taking care of urgent, really important stuff. For a fireman, this would be putting out fires. Metaphorically, that works for you, too. 2) Planning, preparing, and doing long-term important stuff. This is where you should spend most of your time. It’s the most creative quadrant, because you have time to think and strategize without being afraid that your house is about to explode. 3) Working on things that are not important, but are urgent. Sometimes, this means wasting your life on things that other people think are important. If that other person signs your paycheck, you should do it. Otherwise, this is where you need to learn to say no. 4) Plain old wasting time. It’s not important, and it’s not urgent. Free Cell goes here, as well as Jersey Shore, talking or texting incessantly, and so on. I’m sure you can fill in the blank for your own life. A little down time is good for you, but too much will make you ineffective. We quickly decided that we were watching too much TV. For me, that usually means the news. It’s good to keep up with current events, but with today’s 24-hour news cycle, eventually you have to decide that you’ve heard the same story ten times, and you need to move on. I try to listen to the news when I’m doing something else, usually cooking dinner, but when I sit down during the evening and watch another hour, it’s too much. We decided to give ourselves grace on this until after the election. Just nine days to go before withdrawal! Sometimes, it’s hard to decide if an activity is excessive. For example, it is possible to exercise too much. No, really! I have heard that there is research to support this, and I am doing my part to lower the total amount of exercise in the universe. You’re welcome. However, if you are a personal trainer, exercise is going to be a major part of your day. Rather than working out at the gym before work, you’d work out at the gym for work. Since I go into a library building every day, it’s tough to keep those books from sneaking into my work bag and finding their way to my nighttable. It seems that if I bring back two, I’ll take home three more. Witness my nighttable. These are the books that I truly plan to read soon. Every once in a while, I have to go through the piles and convince myself that I’ll never really read this. The next day, I bring a whole canvas bag back to the library, only to start the process over again. Right now, my nighttable is at critical mass. The books underneath are books I actually own and want to read. Most of the books on top are advance reader copies, so there’s no due date on them. There are a few library books, and those always go first so that I can get them back into circulation. 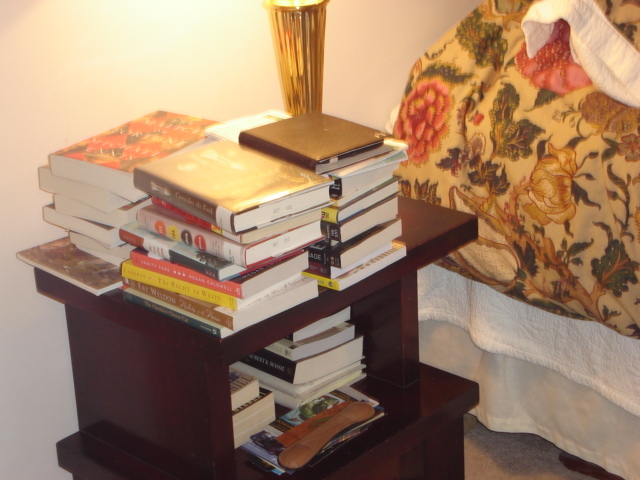 Note that the Nook e-reader on the top is filled with more unread books. The pile of junk underneath is a bunch of bookmarks, which I collect, topped by my beloved weighted bookmark, which allows me to continue reading while I dry and curl my hair. It’s a sickness. As a librarian, I do have to read a certain amount. Conversely, I am a librarian because I love to read. So, I have to read children’s and teens’ books in order to increase my knowledge of the market, but it’s not as if I hate doing it. I read nonfiction and major literary works because no self-respecting librarian (or human being) would skip them, and sometimes I’ll read a fun, fluffy book just because I feel like it. I think that’s OK. Right now I have books on writing, a book on the history of kitchen implements, several Newbery and Printz contenders, a collection of Dylan Thomas’ poetry, a book on how I would be happier if I stayed home (Why do I torture myself? ), and a book on the Borgias in medieval Florence, among many others. At the moment, I’m reading Jon Meacham’s new biography of Thomas Jefferson, which is very good, but it’s the kind of book that takes a while to get through. To tell the truth, I am usually fighting for time to read. One hour less television equals one hour more reading. That is, it would if I didn’t have this awful monster staring me in the face. I refuse to divulge how long this can of Pledge has been sitting on my dresser, but I’m beginning to think of it as an accessory. It all comes down to money, really. 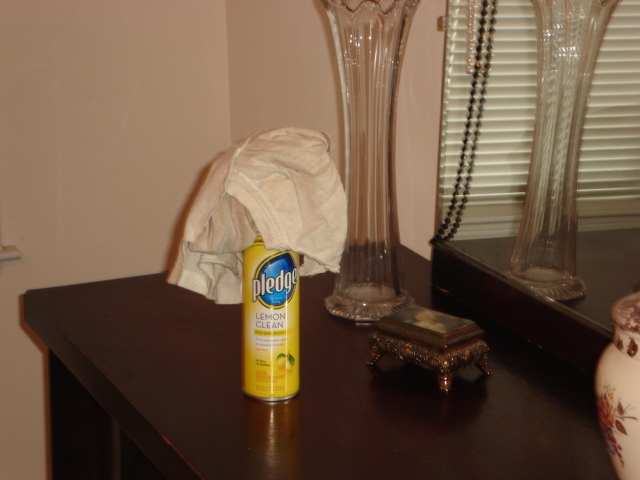 If I were wealthy, I would not have to work all day, plus I could hire a cleaning service. That way, I would just have to schedule my reading around my currently non-existent walks, and life would be peachy. I understand, however, that one must buy lottery tickets in order to win the lottery, and since I am way too cheap to do that, I’m afraid that I’ll have to look at those quadrants again. Too much pressure! Tonight we had clam chowder. I don’t make Manhattan Clam Chowder, which is tomato-based, or New England Clam Chowder, which is creamy. Rather, my family has always made Rhode Island Clam Chowder, also called “pink chowder.” That’s because it has both tomatoes and cream. 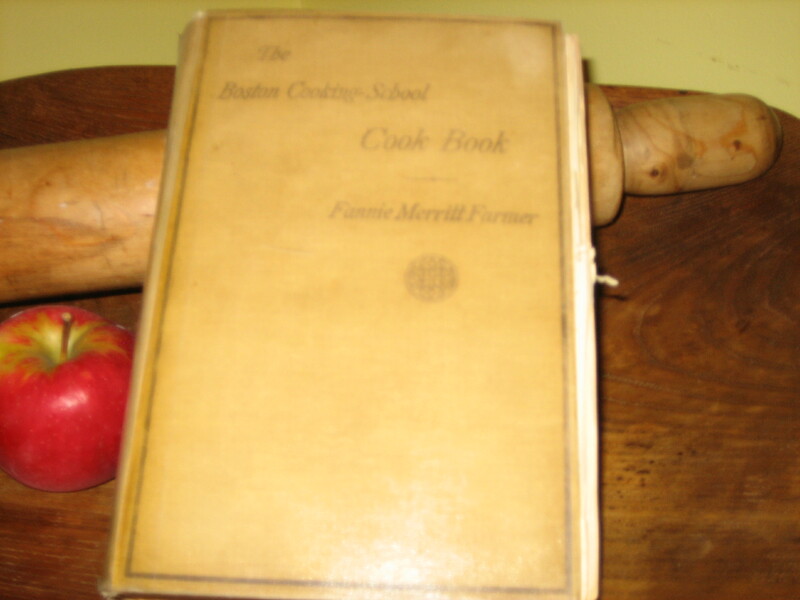 My parents and my brother grew up on it in Rhode Island, and every once in a while when I was a kid, my dad would make chowder and clam cakes, based on the recipes in Fanny Farmer’s Boston Cooking School Cookbook. He would shuck the clams himself! It was delicious, and I could eat a zillion clam cakes with it. The Boston Cooking School Cookbook was originally published in 1896. My mom received a Fanny Farmer cookbook when she got married in 1944, and when David’s grandmother died in 1984, I inherited her 1924 edition. 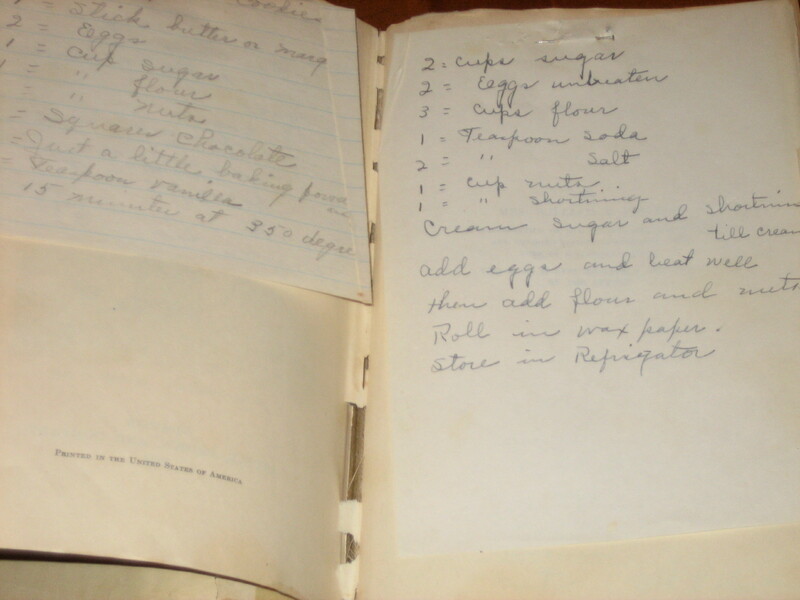 Here it is, in all its glory, with her handwritten recipes attached with straight pins. We had it covered so that it wouldn’t fall to pieces immediately. Chicken recipes start with how to pluck the bird. There are no exact oven temperatures, but it says things like “a hot oven” or “a medium oven,” and it tells you how to arrange the damper of the oven to get the right temperature. It has a recipe for every single classic dish you’ve ever heard of, and it assumes that every good housewife wants her table to be perfectly correct. In the decades since my dad shucked clams, we’ve all played with the recipe a bit, starting with canned clams and canned tomatoes. Now it’s not an all-day event. The original recipe calls for salt pork to start, but I’m not sure that I’ve ever bought salt pork. I suppose I could ask for it at Whole Foods, but I might get some odd looks. My brother, though, tries to stick to the recipe as faithfully as possible, and he won “Best in Show” at a clam chowder cook-off at my sister’s church. It even beat the parish priest’s recipe, which was based on Bloody Mary mix, something that he probably had around the house. My mother skips the salt pork now, too, and uses margarine instead. (*shudder*) I use sausage—plain ol’ Jimmy Dean regular pork sausage. It tastes fabulous, and I call it Lowcountry Chowder. My Yankee forebears are spinning in their graves. Unfortunately, when I was diagnosed with diabetes, potatoes became a forbidden food. I’ve learned to use rutabagas in almost all places that call for potatoes, so I’m OK with that. I once read that a chowder was a soup with potatoes, so I’m not sure that my chowder is legal, but we won’t tell the food police. I also lost the crackers that are used to thicken it, and when I first started experimenting with low-carb recipes, I read that you could use xanthan gum to thicken soups. Not a happy outcome. Michael still reminisces, “Remember when you used to make your clam chowder all slimy? That was so gross.” (See, the important things stick with them.) Now I just have thinner chowder. Every once in a while, Michael will get in the kitchen and whip up a batch of potatoes-and-crackers clam chowder, and David dives right in, although he tries not to let me see. 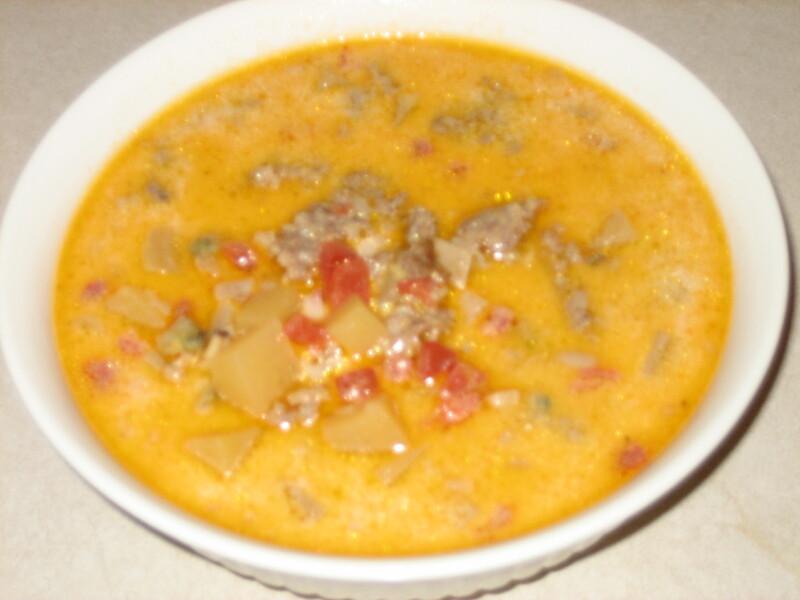 Of course, Michael does use Jimmy Dean sausage in his chowder like his mama, since he’s a good Southern boy. It’s the most wonderful time of the year. 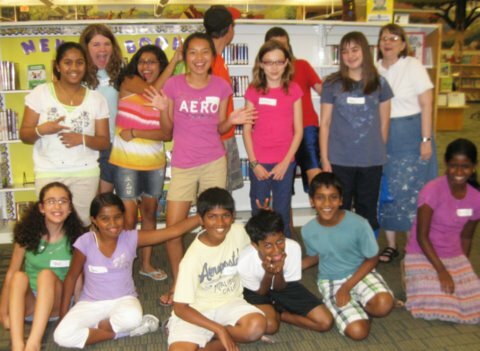 This is the season when I visit the Mock Newbery and Mock Printz clubs in our library system. There are three of them, two Newbery (middle school) and one Printz (high school), and the kids in these groups are avid readers. They have to be, since each group reads about 200-250 books each year! Their purpose is to read all of the books published in each calendar year that are eligible for the Children’s Media Awards, and to vote on them using the same rules as the official committees. They hold their votes just before the national committees do, and then wait to see if their choices won the awards. When I worked in a library, I helped to run one of these groups for five years, so now I look forward to seeing them when I can. We often assume that reading kids are introverts, but that’s not necessarily so. In these clubs, a lot of the kids are very outspoken about what they like or don’t like. Every week, they have to defend their choices. It’s so funny to watch them change over the years! They come into the Mock Newbery clubs as shy eleven-year-olds, saying things like, “This fairy book was so cute and I loved it. I think it will win the Newbery.” Four years later, they say, “Although the character development in this book was phenomenal, the pacing faltered somewhat in the middle, and I found the writing style to be rather pedestrian.” In other words, they come in as typical kids and leave as forty-year-old book critics. Kids who read books and talk about what they read will inevitably become more articulate. When we read nonfiction, we learn something. When we read fiction, we become something. That’s a gross oversimplification, of course, because we can have emotions about our nonfiction and learn a great deal through good fiction, but the experience of losing consciousness of our surrounding environment and seeing the world through another set of eyes belongs in the world of fiction. We all, children included, surrender ourselves to the mind and heart of a well-drawn protagonist, which is why it is vitally important to choose our reading wisely. If we thrill to the adventures of a courageous hero or heroine, we want to be more courageous ourselves. If we read a tragic story in which the main character shows great compassion, we know how to act with compassion when we encounter similar circumstances in our own lives. The reverse, of course, is also true. If a girl reads a steady diet of “mean girl” novels, what sort of person will she admire—or become—in real life? If a child reads widely from an early age, he will have the opportunity to try on many lives. We all live once, but through books we can live for a short time in another country or another time. We can experience the perspectives of people who are very different from ourselves. A friend of mine once said that when she was going to high school in the early ‘70s in the Illinois suburbs, she had friends living through the race riots in Chicago high schools. Although they were not far away, it could have been a different country. The Chicago kids were drinking in racism with their lunch milk, while my friend, who had not yet met a black person, was drinking in lofty ideals and compassion in the good books that she was reading about the civil rights movement. Later in life, when she moved to a more integrated area, her worldview was already formed by the fictional heroes and heroines she had “lived” with during her formative years. In the Newbery meeting last week, I heard a twelve-year-old girl talk about a book she’d read in which a character “was supposed to have been killed as a baby because she was not perfect.” I didn’t hear the whole conversation, but the book was probably a dystopian science fiction book. However, this is not a fictitious issue, is it? When the reader confronts this situation in real life, she will have already had this experience. She already knows someone who was a valuable person, even though a more powerful entity thought that she should have been destroyed before she had a chance to defend herself. Thinking through important questions calmly and at a distance is an excellent preparation for more turbulent times when clear thinking seems impossible. These are just some of the reasons that I think reading kids are so amazing to be around. They’re not afraid to talk to adults because they’ve known so many of them through the pages of books– and they have a lot to talk about. Recommending a book to a child or teen and seeing them light up with anticipation is one of the big reasons that I do what I do. When that reader comes back and tells you how much they enjoyed that book, it’s like getting a gift! These kids will never be bored, and they’ll have the tools they need to learn whatever they want in life. If you have children in your life, be sure to model a love of reading and create an environment full of great books. Start young— and never stop! David and I are Big Bang Theory fans. Ha! David and I are fanatical devotees of The Big Bang Theory, and have watched each season in order on Netflix. Now that Time Warner has given us an insanely great deal, we’ve been recording the current season on DVR and are completely caught up to date! Now I am in mourning that I don’t have anything else to watch. Michael will not watch it, saying that it hits way too close to home. However, he has been able to explain the more gaming-related episodes, although it makes him depressed that he can do that. David and I get all of the other jokes, as we are located somewhere on the periphery of the geek/nerd spectrum. A couple of weeks ago, I brought home the new teen nonfiction book Bomb: The Race to Build—and Steal—the World’s Most Dangerous Weapon, by Steve Sheinkin, not because I am tremendously interested in nuclear weapons, but because it is getting lots of Newbery buzz, and I feel a moral obligation to read everything that is a contender for the Newbery. I put it on the coffee table in the living room, which is my sneaky way of getting my husband and son to read things they wouldn’t see otherwise. (I guess that jig’s up now.) David read it first and loved it, so I had to give it a go. He was upstairs when I started it, and when I got to page 11, I yelled up the stairs, “Sheldon is Robert Oppenheimer!” I could not believe it. Yes, I know that Sheldon and Leonard are physicists on the show, but I did not realize that they were based on actual people. I’m still not sure of Leonard, but Robert Oppenheimer was a tall, skinny, arrogant young physicist when he was chosen to head up the Manhattan Project. He was the type of guy who would audit other professors’ classes and call out things like, “Oh, please! Don’t insult our intelligence!” In other words, Sheldon Cooper. Last week, Bomb was nominated for the National Book Award for Young People. I have finally finished it, and I agree that it is an excellent work of nonfiction. I learned so much!—although that may not be very impressive, since I must admit that the middle-school boys in the Newbery Club that I visited yesterday were way ahead of me in terms of scientific knowledge of things that go “boom.” The book begins with the discovery of fission in Germany and continues in detail through the Manhattan Project and the bombing of Hiroshima and Nagasaki. The very last chapters relate the development of the hydrogen fusion bomb and the last years of the major characters in this brilliant and horrifying passage in our history. Another book that just came out in the past couple of months is Shadow on the Mountain, by Margi Preus. When I read the reviews, I thought, “the Norwegian resistance?” This must be a much larger topic than I realized, however, since Bomb devotes several chapters to the Norwegian resistance to the Nazis, and what a thrilling adventure it was! There are so many little-known people who give everything for the cause of freedom every day. We should be so thankful for them! On the other hand, I was shocked and saddened to realize how little it takes for some people to become traitors to their country. Right from the beginning, the government worried about the physicists’ loyalty, since many of them had come from Germany and Russia. In some cases, their worries were unfounded, but very often, they were right to keep a close eye on these guys. The most crushing, to me, was Ted Hall, who graduated from college in physics at age 18 and was recruited for the Manhattan Project at age 19. Once he started working at Los Alamos, the other scientists thought he was just a quiet loner, but he was really spending a great deal of time deep in thought. He was considering whether it was appropriate for only one nation to have this enormous secret about how to build an atomic bomb. He decided that, since Russia was not our enemy, but was also fighting Germany, they should also have a nuclear weapon. So he found a convenient KGB agent and passed on the information. Everything. He knew everything, and he told them everything. And that is how Stalin tested a nuclear bomb very shortly after Hiroshima and Nagasaki. Truman was stunned. If you don’t know much about Stalin, please allow me to highly recommend last year’s Between Shades of Gray, by Ruta Sepetys, a story based on the author’s grandparents. I was amazed to find out that there has been a human being even more evil than Hitler. You might be able to tell by now that I really appreciated this book. At about 250 pages (depending on how much of the resource notes section you want to read), it is appropriate for teens and adults. There is some mild bad language in the quotes from the physicists, but they were scientists, not sailors, so you may be able to overlook it. Now I have to go back to the Big Bang episode where Sheldon gets depressed and buys all those cats that he names after famous physicists. I may recognize some of the names this time! My neighborhood is exploding. Along with the autumn leaves and cool temperatures has come a need, evidently, to discharge tons of ammo. We live in a pretty nice subdivision, but it’s tucked into the woods out in “the county,” and there are no firearms restrictions here. Last night, my son asked disgustedly, “Why has our neighborhood suddenly turned into a firing range?” Then again, Michael can’t wait to live in a high-rise apartment in downtown Raleigh. It’s not deer season yet; it starts November 10th. My husband thought that it was dove season, but I didn’t think our neighbors would waste this much ammo on doves. So little meat for so much work—not to mention the broken teeth from birdshot. Besides, dove season also starts (again) in November. I looked all of this up on the North Carolina Wildlife Resources Commission website. I did find some reassuring news on this well-designed website, though. Teal season ended on September 26th, so now we know that our neighbors are not shooting at us. Or else they’re just very poor marksmen. When you look at the people doing the shooting, it just doesn’t add up. OK, my left-neighbor-but-one is a retired military officer, so I figure he’s just keeping his hand in. However, the neighbor to my right is from New Jersey, and I don’t know anyone from New Jersey who even thinks that people should be allowed to own guns. The neighbor to our immediate left is… well, OK, you’d expect him to be shooting a gun. When we got home from church today and were getting the Whole Foods bags out of our trunk, it finally dawned on me that the people I could actually see shooting (New Jersey was out there today)were teaching their kids to shoot. Redneck to the left has been teaching his S.O.’s teenage boys to shoot for a while now. New Jersey, though, is teaching his young daughter to shoot. The picture gave me pause. Are we preparing for the apocalypse here? David and I were laughing and joking about it, and I said how much ammunition was being wasted on target practice for kids. David brought me up short by saying that it was better to waste it now than when your kid needs to shoot and can’t hit the broad side of a barn. Then he told me that someone from Cary told him today that he’d bought a .22 semiautomatic. So guess what we’re doing this afternoon! We’re scrounging through our packed garage, looking for our shotguns and shells, taking them out and cleaning them (the guns, not the shells). Since I haven’t shot a gun in 30 years, I should probably relearn the skill. Why? I don’t know. When the apocalypse comes, it’s not the time to say, “Where did I store those shotgun shells, anyway?” We may be rednecks, but we’s armed rednecks. In my profession, I read a lot of the first books in series. Usually, that tells me all I need to know to help a patron decide whether this book would appeal to them. If I read the rest of the series, it means that the book was a real favorite. Well, I was eagerly awaiting the arrival of The Crown of Embers, by Rae Carson, sequel to The Girl of Fire and Thorns. Since I don’t know if you’ve read Girl of Fire and Thorns, I can’t tell you about Crown of Embers without spoiling it for you! So, I’ll set up the first book and you can discover book two for yourself. Elisa is a Bearer. That is to say that she bears on her body a gemstone that sets her apart as the person most connected to God in 100 years. She has special gifts and powers, and has had to be thoroughly educated, especially in a quasi-Christian religious history and scripture. Where is this gemstone? In her navel. Yes, she has a bejeweled bellybutton, and she can’t remove it. Were someone to attempt to steal the Godstone, they would have to kill her and cut it out of her, and there are plenty of people who would be perfectly happy to do so. Since Elisa is part of a family of royalty, she must marry well so that her father’s house will be strengthened. And since Elisa is fat and plain, her father is not expecting the suitors to line up at his door. Ms. Carson has set her novel in a sort of alternate Spain, probably in the middle ages or so. Elisa is dark-skinned and dark-haired, and the people and places have pseudo-Spanish names. At long last, Alejandro, the king of a neighboring country, decides to take Elisa as his bride for political reasons. She has such low self-esteem that she’s relieved that anyone stepped forward. When Elisa arrives in his kingdom, though, she finds that, even though her prince is a very nice, mild-mannered guy, he intends to continue his long-standing relationship with a beautiful— though not marriageable— woman of the court. Elisa and Alejandro are quietly married, and on the wedding night, he tells her that although he may be required to produce an heir someday, it won’t be tonight, thanks. Before Elisa’s coronation, she is kidnapped by a band of outlaws because of the bellybutton thing. They want her power, and at the moment they’ll let her live so that they can force her to wield magic for them. If she refuses, well, it’s really the Godstone they’re after. She is disposable. At this point you’re thinking, “Surely Alejandro or Elisa’s father will rescue her, and Alejandro will fall deeply in love with Elisa for her keen mind and depth of character!” Not even. As the novel continues, though, the reader comes to respect her more and more as she grows in strength and courage. She is the anti-Bella: tough, smart, and honorable. The book is not predictable, as Rae Carson is second only to George R.R. Martin in her cheerful willingness to kill off major characters. Once in particular, I thought, “Oh, no! This can’t be happening! Surely he is wearing a bullet-proof– er, swordproof vest and just got the wind knocked out of him! He’ll stand up in a minute.” He doesn’t. I must confess that when I started Crown of Embers, I peeked at the end just to see if Elisa lives all the way through. Since Carson leaves us on a cliffhanger ending, and there has to be a third book, I’ll let you draw your own conclusions. In any case, I felt that I could not trust the author to make things turn out happily, and that’s just as it should be. If I could comfortably breeze through, knowing that she would never let certain things happen, it wouldn’t be nearly as fun. Furthermore, none of the characters are portrayed as completely good or bad, and Elisa is truly fair and realistic in her expectations of other people. These books are appropriate for older teens and adults, particularly for those who love a strong heroine, adventure, and romance. Highly recommended. The usual disclaimer: Opinions expressed are solely my own and do not reflect those of my employer. I read library copies of the books, but if Harper Collins wants to send me a galley of the third volume, I would not complain. Earlier this evening, my son and I were talking over old times. Now, this is rare in our house. My son is usually safely ensconced in his cave, talking to virtual people, and I’m usually doing some kind of chore. It was so great to sit on the sofa after dinner, talking about the future and the past. We started laughing over a household construction/demolition project that we did on our house in Georgia when some friends came to visit for a weekend and the husband helped David. It was one of those comedies of errors, discovering one setback after another, the type of thing that would make you crazy if it were not that it was shared with dear friends. Then it hit me that this old friend died late last year, and we’d never be able to add to our memories of him. We suddenly became very quiet. I have come to a point in my life when I say good-bye and other people move on. In the first twenty or so years of our marriage, David and I moved to a new state about every five years. Even when I was growing up, we moved a few times. I was always saying good-bye to people I cared about, leaving them where they were and moving on to new adventures. The house we live in now is the house that I have lived in for the longest period in my whole life: eleven years. Now I stay put and watch people leave. I’ve had co-workers, fellow church members, and friends move away or just leave. I’m so glad for Facebook, overwhelming as it can be, since I can keep in touch with my friends and family in six or more states so much better than anyone could just 20 years ago. Almost all of my parents’ movie stars and singers have died, and now mine are dying, too. Michael Jackson and I were born the same year. At lunchtime today, a co-worker was watching Inside Edition in the break room, and when they mentioned the stars’ names, I thought, “Who?” We are leaving, heading to the Western Lands. The Lord has ways of preparing us for change, even when we’re oblivious. A nine-months-pregnant woman is so uncomfortable, never getting a decent night’s sleep, missing her pepperoni pizza without Tums, and wishing for a fabulous pedicure that she could actually see, that she is willing—no, eager—for labor to begin, even though she knows what’s coming. For all the tears shed by moms at college campuses when the baby bird leaves the nest, the Lord made teenagers so annoying that the ties that bind are fraying and ready to break. We love them, but the past few years have taught us that they need to be adults on their own. Our job is done, or at least has changed drastically. My mom is a healthy, active woman in her eighties, but she is watching her friends from childhood get old and pass away. If I’m already seeing this now, what I will I feel like if I live into my eighties? I’ll miss everyone, I’m sure I will, and I’ll be ready to join them. If I did not have faith, I would despair. I know I’ll join Ed; I was there when he gave his life to the Lord. We may be sad, but they are eternally joyful. Sometimes life seems to be streaking past, but in the hollow places, the places in the heart where someone used to be, there is an ache. The time of singing has come….